Brownpatch is caused primarily by Rhizoctonia solani. It is a cool weather fungal disease of St. Augustine and other grasses. Brown leaves pull loose easily from the runners. 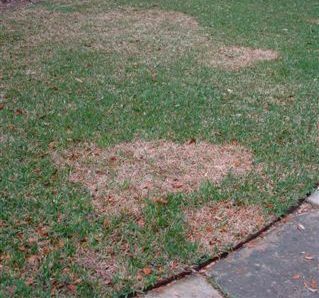 Small spots in the lawn grow into large circles or free forms that look bad and weaken the turf, but rarely kill the grass. High levels of nitrogen and too much soil moisture cause this disease. Brownpatch is easy to control. The solution is healthy soil and the organic program. This disease appears anytime from spring to fall, but it is the most common in the cooler months, especially in the fall. People who still recommend toxic chemicals for this problem are foolish. The look of Brownpatch in St. Augustine. Some people lament the passing of Bayleton. The elimination of this toxic chemical is nothing but good. Bayleton hasn’t officially been taken off the market, but it's hard to find and very expensive. The organic products work much better anyway. All fungal disease problems can be prevented by having a healthy and well-maintained soil, which produces healthy turf. Organic gardeners usually have little problem with turf disease. Never mix organic techniques with chemical controls. It’s a waste of money and won’t work. Granules are better for prevention and liquids are better for cures. Watering the lawn at night (5 p.m. to midnight) is not a big deal - after all it rains at night. Water heavily and wait longer between watering. Avoid high nitrogen fertilizers and always use organic fertilizers. Toxic chemical controls don’t work. They kill beneficial microbes. Healthy soil with proper drainage is the answer. Toxic chemical systemic fungicides are the most dangerous of the toxic chemicals. Brownpatch can become immune to chemical fungicides.